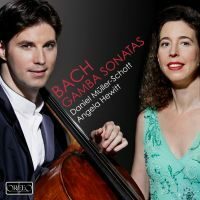 Angela Hewitt’s first chamber music CD is with the brilliant young German cellist, Daniel Müller-Schott. Both artists were brought up on the music of Bach, and their collaboration in these wonderful sonatas is a joy to hear. 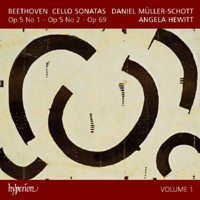 Angela Hewitt is joined by the outstanding German cellist, Daniel Müller-Schott, for her first chamber music CD for Hyperion. Beethoven’s Sonatas for piano and cello are works brimming with life, with the instruments engaging in colourful dialogue. 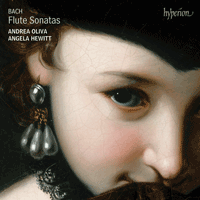 This disc contains the first three sonatas, including the one in A major, Op. 69, written when Beethoven was at the peak of his powers. 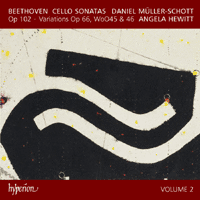 This second volume of the Sonatas for Cello and Piano by Ludwig van Beethoven completes the cycle begun in 2008 by Daniel Müller-Schott and Angela Hewitt. Recorded in the stunning acoustics of the Jesus-Christus-Kirche in Berlin, this CD includes the final two sonatas (Op. 102) which are totally different in style and construction from the earlier ones. The slow movement of the D major Sonata is one of Beethoven’s most touching moments. Also on the CD are three sets of variations, which delight with their freshness and invention.